Wovenwar are currently gearing up to release their somophore album, Honor Is Dead, on October 21st. Prior to the official announcement of the album, I fired some questions over to legendary ‘skin-smasher’ Jordan Mancino. I quizzed on the new album, their upcoming tour with Soilwork, whether his kit setup had changed since I last spoke to him and also his recent fill-in work for Unearth. Thanks to Andy at Metal Blade for organising and Jordan for his time. You’re currently working on what will be the follow up to your first album. How have the sessions been going? We are all finished with the new record at this point and the record sounds better than any of us could have expected. We just recently released the new track, Censorship (you can view this below), which I believe shows the development and overall direction of the album. Musically, is the album similar to the first one or has it got a couple of changes to the formula? There have been a few changes, which are apparent when you hear the new record. However, we are still the same band and you still hear us, but with much more intent and clarity. Simplest way to detail those changes is to hear the record, since it is the most obvious statement we’ve ever made together musically. Was the production process behind the album any different? Yes, we took a different approach this time around. We recorded and produced everything ourselves. We tracked drums at a different studio in San Diego (Rarefied Recordings), Josh tracked himself and Shane at his studio Echelon in Birmingham, AL, and Nick and Phil both tracked themselves at their home studios. The mixing was handled by Nolly (Periphery). The only production aspect that was repeated from the last record was the mastering which was done at Sterling. You’re going to be heading out on tour with Soilwork in the US soon. Are you looking forward to that? Indeed, I am! They have been one of favourite bands and one of the bands that lead me in to many of the melodic death metal bands that inspired me then and now. We’ve been on tour with those guys a handful of times over the years, so I have no doubt it will be a solid run. On a side note, you’ve been filling in on drums for Unearth. How’s that been going? It’s been a great time. I’ve been a fan of the band and I’m honoured to help out while Nick recovers. These guys are shredders, but I genuinely enjoy the challenge and stoked to help out my brothers. In terms of your kit, has that changed much since the last album or not? My kit on tour and in the studio seems to changing up a bit depending on the situation. Right now my preferred set up live and in the studio is (2) 24″ kicks, 18″ floor tom, 16″ floor tom (on my left side), 12″ & 10″ rack toms, 14″ snare. Cymbals are about the same as they’ve been, but I took away the X-Hat when I started using less rack toms. I have been using this 19² K-Hybrid Trash the last few sessions and tours that I really love. Zildjian always out does themselves with the legacy series developments. They never disappoint! Have you got any plans for a European/UK tour soon? Nothing on the books yet, but we are planning to be there no later than summer of 2017 for festivals. Who knows though, it’s possible we will be heading over there on some sort of club tour before then. We’ll keep everyone up to date for sure. And finally, what advice would you give to a new and upcoming band? Write, rehearse, play shows, and keep it together on and off the road. Don’t loose site of the bigger picture and don¹t be afraid to grind it out while you find your niche. Much is learned through experience and can make a band better and stronger if you don’t get distracted. 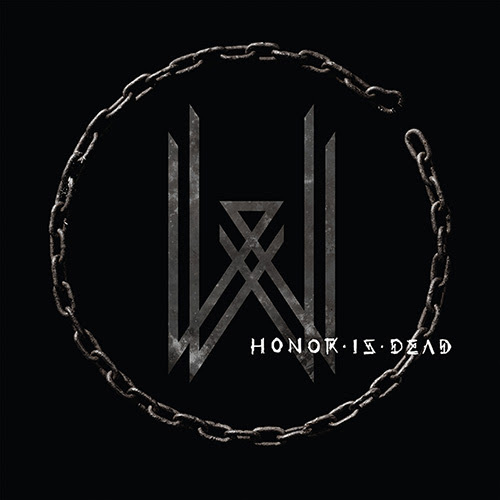 Honor Is Dead is scheduled to be released on October 21st via Metal Blade Records.